I've been so selling/moving/new house obsessed lately, I realized that I haven't posted much about the kids so here's a run through. Third grade continues to be an off an on struggle. We'll get to points where I think everything is fine and then to turn around and something else is an issue. Thankfully, she is meeting with the guidance counselor now to help her feel like she fits in better in class. I really like our GC and Caroline seems positive after meeting with her just one time so far. As for her academics, she reads like a maniac and goes back and forth with math. One day it's easy for her and the next day a struggle. One day she's playing math games online and the next you can't convince her to even attempt the extra credit assignment that was sent home. Her assessments have improved but she'll let that slip from time to time generally because she tries to rush through one. She'll get it - she's already improved a lot since the year started. Just gotta keep encouraging her and supporting her. 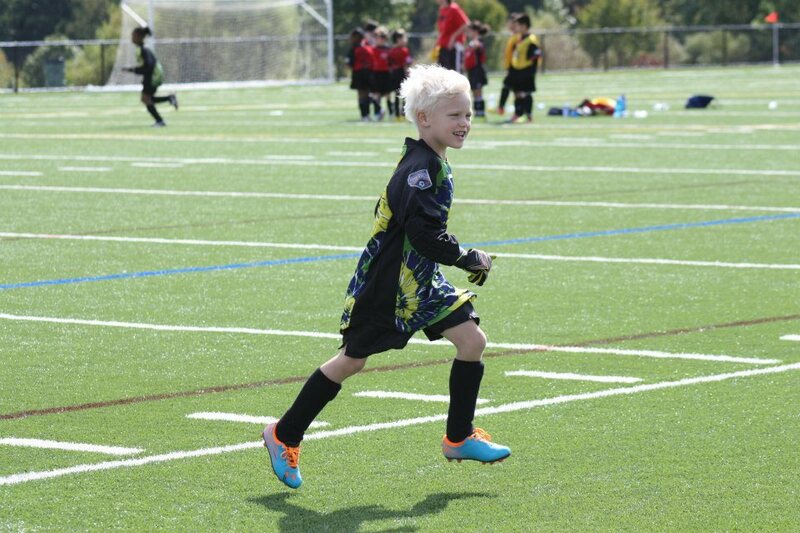 Soccer is going great for Bryce too. He got a really great coach this year and Jason has been pulling assistant coach duties. While he's far from being a soccer star, he loves it and Jason said he thinks he has a lot of potential possibly in goal. (Of course Bryce LOVES hearing that he's taking after his dad.) He's all set to play indoor soccer again this winter too and hopefully with the same coach. He has his final game(s) of the outdoor season this weekend in a tournament. For his birthday, he got Mario Kart for the Wii and he's quite good at it already. Uncle Jesse will be proud of his pupil. I am TERRIBLE at it but I still have fun playing with him. Although I will say that Bryce is a sore loser and bad winner in that game. He jumps all over the place too and really gets into it. He's just such a boy sometimes. Mr. Bryce is going in true Star Wars style again with being Darth Maul. The costume itself is kind of cheap but the mask makes up for it. And then when we went to Target this weekend he convinced Jason that he HAD to have the double ended, Darth Maul, light saber for his costume. He can't take it to school, obviously but it should be fun for trick or treating/trunk or treating and photos. Kind of fitting he's going to be Darth Maul since he got to "fight" him at Disney World this past spring. Oh Piper, that little girl just makes my heart happy most days. Although she has days that we call "Piper Cry Cry" days when every little thing makes her cry. Good heavens. But she does bear the brunt of her sibling's criticism many times too. I worry that she'll take some of the things they say to heart before we can cut them off. For Halloween she wanted to be a fairy too but after the Target.com costume debacle, we went to Target and exchanged it for a Merida "Brave" costume. They were out of Merida wigs (and I didn't want to run all over town or order one online and pay ridiculous shipping) so I got her an Ariel wig. Not curly like Merida's but it's RED. Very red. If you remember she was Snow White, complete with a wig last year too and also has a purple wig as well so this kid likes wearing wigs. 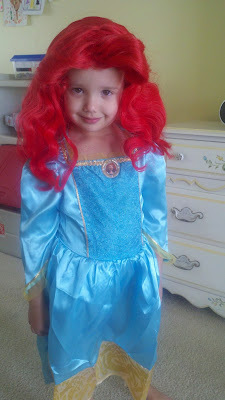 Quite honestly, there's something about little kids in wigs that cracks me up. I think she is excited about the costume but she did say something the other day about being sad not to be a fairy. Here's hoping she'll get back into being Merida before the big day. School is going great for her and I'm so glad that we got her into this program. 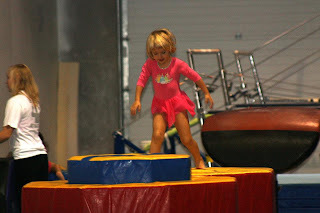 She feels like a big kid now and is into the routine. She even had her school pictures taken last week and I cannot wait to see them. She says such funny things all the time now and I really need to write them down. There's just something about the way she says things and her expression that kills me. Often she'll come at me and say, "Mommy, I need to give you a SQUEEZE!!!" And of course, I oblige. How can you not hug the most huggable little girl in the world? As for gymnastics, Piper is doing great with those too. 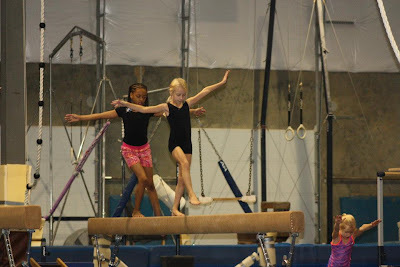 In fact, last week her coach came out to me and said that she would like to invite Piper to be in the "PreSchool All Stars" class which is invitation only. She said she has very good body control and that she's really excelling. I haven't told Piper or Caroline since I don't want Caroline to get upset nor do I want Piper to get all braggy. I have told Piper that she's doing well and since she's having so much fun, that's all that matters. So all in all, fall is going well. I'm a little nervous about Christmas since so many things are up in the air but we are taking it day by day and no matter what, we'll be fine. We're a family, after all.